The UNCG Online Guidebook outlines the services offered to the UNCG academic community and by other units on the UNCG Campus. UNCG Online consulted with other university partners (University Libraries, Digital Media Commons, University Teaching and Learning Center, instructional technology consultants, Instructional Technology Services, etc.) in the creation of this Guidebook. The Guidebook was also vetted by UNCG Online’s Academy of Online Professors (see page 13 of the Guidebook for a list of Academy Members). The UNCG Online Guidebook is presented to you as a “View Only” document. UNCG Online will update this document as needed and send revised versions periodically, as needed. 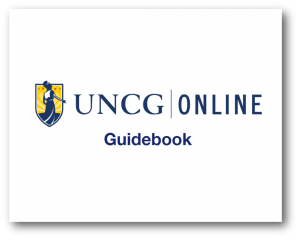 If you have suggestions on how UNCG Online can improve the Guidebook, please contact Nichole McGill (ntmcgill@uncg.edu).